Taron Egerton, Jamie Foxx, and Ben Mendelsohn are mighty charismatic, but they can't save this embarrassing train wreck of an origin story. This year has seen a (small) handful of movies as bad as Otto Bathurst’s revisionist new “Robin Hood,” but none of them — not “Mile 22” nor “The Happytime Murders” nor even Dinesh D’Souza’s “Death of a Nation” — have been more in denial of their own badness. If nothing else, this accidentally hilarious, goofy train wreck of an origin story most definitely has the courage of its convictions. Alas, the film isn’t smart enough to recognize that its convictions are dumb, and it doesn’t have the goods to back them up in the first place. Brace yourselves for an “edgy,” modern (but not modernized) retelling of a really old myth that opens with a voiceover instructing viewers to “Forget history, forget what you believe, forget what you know,” before launching into a wannabe blockbuster so derivative that other directors should receive its residuals. Gird your loins for a misguided attempt to profit off the public domain that takes its one big idea — what if we marketed 15th century class warfare to millennials? — and leans into it so hard that the movie starts to feel less like Robin Hood than it does a castrated “Riverdale” spin-off for Bernie bros (it’s always fun to watch a shameless product of capitalist machinery try and sell itself on socialist ideals). “Robin Hood” is ridiculous from the moment it begins, though the charisma of its cast and the absurdity of its action are enough to sustain interest for a while. The first thing you have to realize about this new riff on an age-old hero is that he’s basically just Batman, minus any of the compelling backstory; par for the course in a movie where everything could be described as “basically just Batman, minus any of the compelling backstory.” Played by “Kingsman” star Taron Egerton (a talented actor whose cocky mischievousness the film mistakes for an actual character), young Robin is the most eligible bachelor in the entire kingdom. A loaded orphan who lives in a giant keep above a mining town, Robin spends his time dressing up as a thief and perfecting his “Assassin’s Creed” cosplay as he skulks around the local barns. Does he rob from the rich and give to the poor? Unclear. He mostly seems interested in stealing hearts — Marian’s most of all (Eve Hewson, as anonymous here as she was exceptional on “The Knick”). Alas, right after things get romantic, Robin receives a draft notice for the Crusades. Literally, someone nails a piece of paper onto his door that says “Draft Notice” in big letters, which would feel wrong even if it was how people became Crusaders (which it most definitely was not). It’s the first of many regrettable instances in which Bathurst — a capable lad known for directing the pilot of “Black Mirror” and season one of “Peaky Blinders” — tries to superimpose a modern gloss over medieval times. When Robin’s unit leaves Gotham and gets ambushed by archers in the desert, Bathurst shoots the action like it’s an incoherent deleted scene from “American Sniper.” Arrows tear through the sand like bullets as the English fighters scramble for cover in a shaky-cam massacre, the Iraq War parallels so obvious that you half expect Robin to complain that he was sent into battle without an exit strategy; to that end, perhaps it’s appropriate that the special effects look like they’re from 2003. The idea, of course, is that time is a flat circle, and the powerful will always prey upon the dispossessed unless someone rises up to even the score. The same thinking has underpinned several other films (Baz Luhrmann’s “The Great Gatsby” comes to mind as a recent example), but here it feels silly and strained. Things only get worse after Robin returns to England with a stowaway in the hold of his ship: A Saracen fighter (Jamie Foxx, in a dispiriting magical black mentor role), whose son Robin had tried to save from execution. Marian, thinking Robin died in the Crusades, has taken up a job at the mine, where she feeds the laborers while wearing full mascara and a series of leather jackets that she appears to have stolen from the set of “Gossip Girl.” Her only memorable line? A stolen quote from a first-century Jewish scholar. Is that because screenwriters Ben Chandler and David James Kelly couldn’t be bothered to write their own generic pep talks, or is it a knowing illustration to how the past can wrap around the present? Let’s generously say that it’s both. And then there are the men in Marian’s life. First up is a two-faced new crush played by Jamie Dornan, and the only thing you need to know about his character is that naming him “Harvey Dent” would have violated copyright law. 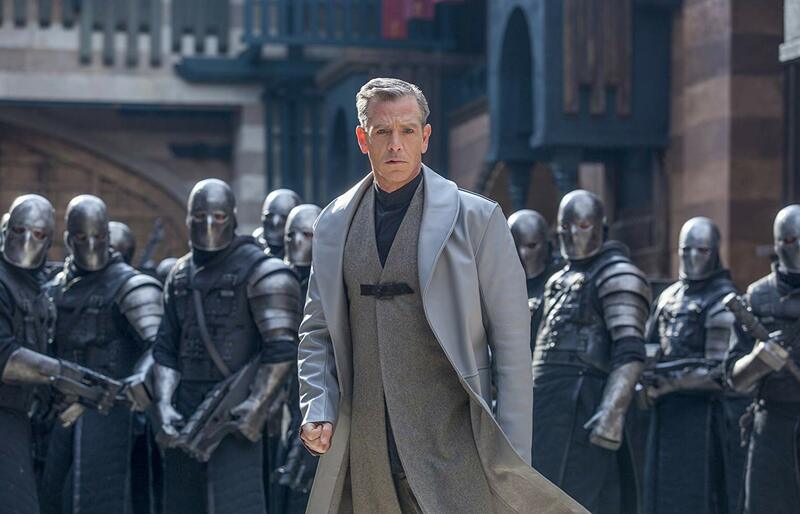 Meanwhile, the sniveling and corrupt Sheriff of Nottingham (Ben Mendelsohn, acting with the bumper lanes up) is up to no good, conspiring with the Catholic Church and against the common people while fear-mongering about foreign caravans in Arabia. “I’m the law and order, here!” he barks. It’s enough to remind you how much scarier Donald Trump might be if he were a dashing middle-aged man who could actually string a few sentences together without embarrassing the entire human race. Naturally, just a few training montages later, Robin becomes the leader of the #Resistance. He calls himself “The Hood,” and inspires the underclass to rise up by shooting a volley of arrows at everything that moves. Egerton’s archery skills are mighty impressive, but they’re augmented by chintzy effects, and obscured by set pieces so erratic that it’s hard to understand when they began, let alone why they’re happening. Even for viewers receptive to the matinee ridiculousness at work, “Robin Hood” is too messy to enjoy; there’s nothing wrong with a fiery horseback chase through a mine and along the parapets that run above it, but the sequence is halfway over by the time you can even tell it’s underway. If only this anti-establishment action saga weren’t so totally in love with the establishment it claims to despise. If only it weren’t so desperate to be the foundation of a cinematic universe that it treats Little John meeting Friar Tuck (Tim Minchin) like they’re in the post-credits scene of a Marvel movie — like you’re supposed to get a chill down your spine at the sight of a homicidal Moor befriending a manic clergyman. Chandler and Kelly go to incredible lengths to set up a sequel, but even more incredible is how the film genuinely seems to believe that people might want to see where this story goes next. Lionsgate will release “Robin Hood” in theaters on November 21.